$35.99 & FREE Shipping on orders over $59. We recommend Acti-ML and Opti Malo Plus to have a successful secondary malolactic fermentation. Acti-ml, use 0.84g per gallon when hydrating the bacteria. Opti malo plus, use 1 gram per gallon and add to wine at the same time as bacteria. Helps extend the time that the yeast stays cool in transit. Cool temperatures help keep the viability of the yeast higher which in turns leads to faster fermentation start times and better beer. The Insulated shipper helps the ice last much longer, however neither option will ensure your yeast stays cool the entire trip. MBR 41 was isolated in the Abruzzi region of Italy during an extensive European Union collaboration for use in red and white wines. MBR 41 was chosen for its good implantation, steady fermentation, high alcohol tolerance (up to 15% v/v), enhanced mouthfeel and wine structure. This strain will ferment well with a pH above 3.2 and total SO2 levels up to 50-60 ppm. In red wines, increased spicy, cherry and red fruit flavors have been noted. Red and white wines fermented with MBR 41 have increased richness and complexity. 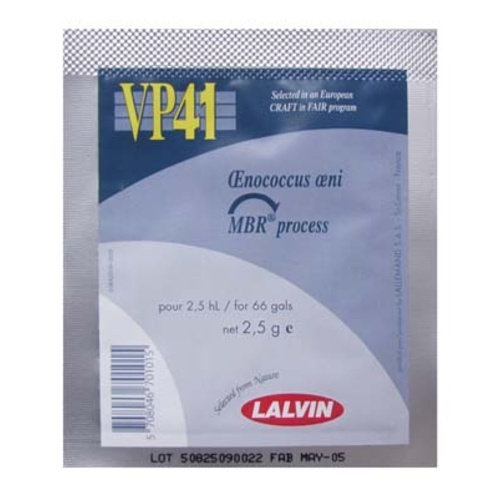 You can't store malolactic bacteria once the package has been opened. Note: Malolactic bacteria added during the ferment will compete with the yeast for nutrients and are atagonistic to yeast, sometimes causing problems resulting in stuck or stalled fermentations. The best time to add an ML culture is after racking off the gross lees. Works very well for reducing the acidity of overly tart apple juice for hard cider. I press my juice with about 50% very acidic crabapples, and this takes the excessive malic acid and leaves a very pleasant, fruity, complex cider which is well balanced despite fermenting to full dryness ( I use staggered pitches of 71b, d47, and qa23 yeast). Good results in the past. Lagging MLF, need a more robust MLB. Will use remainder for fall harvest. you were out of C-16! Wide range of acceptable wine conditions for success. This stuff is expensive but it ALWAYS and I mean ALWAYS gets the job done. Followed the instructions to the letter and it worked quickly with no problems. I used the recommended nutrient. Great Product that was delivered on time. This has always started MLF within a day or two and finished completely. I am even able to split the 2.5g and add just 0.21g per "5-gallons". I typically sprinkle on top of each 70 pound batch of red wine after fermentation and a day or two before pressing. It's a great one to use for a fast and complete MLF and for Co-inoculation. I have used VP-41 for a few years and always found it to work well. I usually have 10+ carboys of different red wines that typically have rather low pH. I hydrate one packet of the VP-41 and divide it between all the carboys. Usually MLF has finished in all in 6 to 8 weeks.